Combining the refined, elegant look of wrought iron with the ease of maintenance-free aluminum, an aluminum fence is sure to add value to any home. Aluminum fences are built to last, won’t rust or rot, and can fulfill any common fencing needs. Aluminum fences are also very strong and can take a lot of punishment. They are available in a wide variety of styles, colors and heights to fit into any landscape. No other fence will do so much to enhance your home, pool or commercial property. 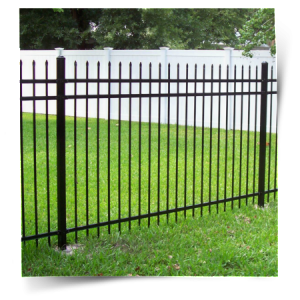 Our fencing contractors are trained and have years of experience working with aluminum fencing. We ensure that the job is done right the first time, on time and within budget. For your aluminum-fencing project, call us! We’re the local experts on the matter! All of the aluminum fence products we install are made in the USA. There are the manufacturers we work with: Alumi-gaurd, Jerith, Delgard.